On top of being a mobile military airport, the USS Ronald Reagan is its own floating city, with at least 5000 sailors on board at any time. 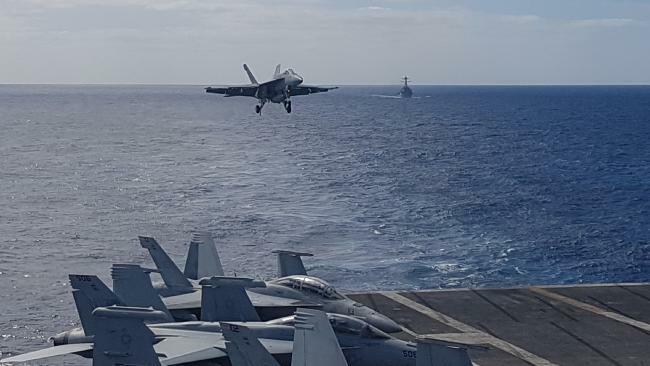 MINUTE after minute the noise of fighter jets either landing or being launched off the deck by catapult fills the air of the USS Ronald Reagan. In a room nearby, four men sit around a table with small cut-outs of wooden aeroplanes and toy soldiers on a table they've dubbed the Ouija board. At first glance, it looks like they could be playing a board game while wearing headsets, but in reality, it's the nerve centre for the fast-paced flight operations. Lieutenant Commander Terrance Flourney, the flight deck handler, said they are in charge of anything that moves on the flight deck or on the hangar bay levels of the ship. "It's organised chaos at its best," he said. "There is no room for error. "We've got a number of folks who help us in the success of the mission." At any one time, Lt Commander Flourney can be speaking to the person in front of him or suddenly to someone on the bridge or flight deck through his headset. 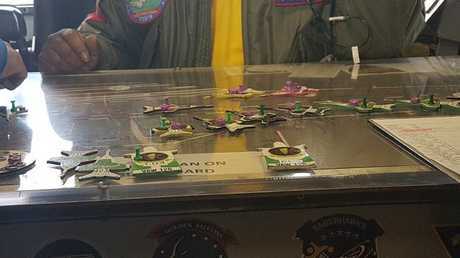 Flight deck officer, Lt Kenyatto Mayes, said the 'Ouija board' helps assist them with the movement of all of the aircraft on the ship at any one time. He said having the human factor, over technology, contribute to the nerve centre was beneficial. "In front of us, the board gives us a snapshot view and status of all of the aircraft," he said. "The status of the aircraft changes all the time. "This tells us which one aircraft is going to shoot - or launch - first, second or third. "If we have a jack on a piece, that means that aircraft is damaged and needs to be jacked up in the air to be fixed." The ‘Ouija board’ helps assist them with the movement of all of the aircraft on the ship at any one time. 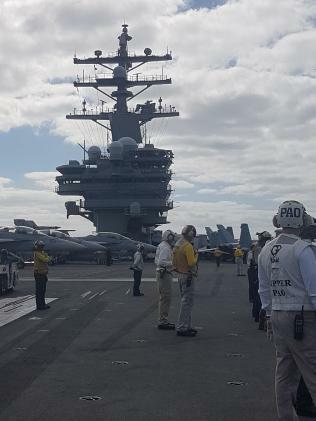 The USS Ronald Reagan, named after America's 40th president, was commissioned in July 2003 and has been based in Yokosuka, Japan since late 2015. The Nimitz class airline carrier - which towers 20 storeys above the waterline, is 334m long and 77m wide - is scheduled to pull into Brisbane for a port visit late Sunday, but no public tours are available. The flight deck of the nuclear-powered ship is 1.82 hectares (4.5 acres) in size, which is where the approximately 65 aircraft are either parked, or taking off or landing at any time of the night or day at high speeds. Aircraft attached to the ship, which was about 644km off the coast of Brisbane this week as part of Exercise Talisman Sabre, are US Navy F/A 18 Super Hornets, an E-2 Hawkeye, EA-18 G Growlers, MH-60 R/S Seahawk helicopters and a C-2 Greyhound. Even with ear plugs, a helmet and additional ear protection on, the noise on the flight deck from the mostly hornets taking off every minute or two can still sound like a powerful, giant vacuum cleaner. A steam-powered catapult system helps launch most aircraft off the ship in what feels like a human slingshot, sending a plane from zero to hundreds of km/hr in mere seconds. A 22,500kg aircraft can also go from about 240km/hr to zero in about 100m in seconds when landing, thanks to a mechanical cable called the arresting gear, which looks like a bungy-rope version of a brake system. There can be up to four arresting wires laid out so the pilot has a choice of one to catch on a tail hook. On top of being a mobile military airport, the USS Ronald Regan is its own floating city, with at least 5000 sailors on board at any time. About 18,000 meals are served a day in the ship's three separate mess areas, while the only way between the ship's many floor levels is to climb a number of ladder-like stairs. On the ship, the sailors have access to everything from dentists, gyms, a hospital, vending machines to university degrees, as the ship can deploy for up to a year at a time, though more often or not it deploys for between four to six months. Talisman Sabre is a biennial joint Australia-United States military exercise that started in June. 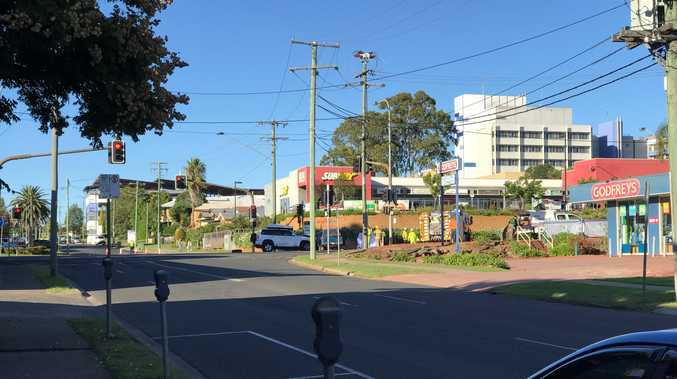 This year it involves more than 33,000 mostly Australian and US troops, 20 ships and more than 200 aircraft, with the majority of the mock war taking place in and around Shoalwater Bay in Central Queensland.